Christopher T. Brandt - Fanning Harper Martinson Brandt & Kutchin, P.C. - Fanning Harper Martinson Brandt & Kutchin, P.C. 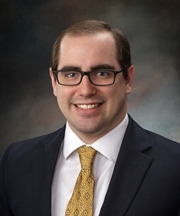 Christopher Brandt joined Fanning Harper Martinson Brandt & Kutchin, P.C. as an associate in 2018. He graduated from Cistercian Preparatory School and the University of Notre Dame with a Bachelor of Arts in The Program of Liberal Studies and a Bachelor of Arts in Film, Television, and Theatre. He graduated from the Southern Methodist University Dedman School of Law in 2018 and studied International Human Rights Litigation at University College Oxford in 2016. During law school, he served as President of the Law Students for Life organization, Vice President of the Federalist Society, and a member of SMU’s American Association for Justice Mock Trial team. He competed in on-campus mock trial competitions where he received multiple awards. Christopher also directly represented clients in the SMU Criminal Justice Clinic. Christopher’s practice areas include civil rights and employment litigation, local government defense, school law, and appellate advocacy.